Many researchers totally forget there was a US-Mexican War, 1846-1848. But often we can findl veterans of the Civil War that also served in the Mexican War. Most know that by the end of the US-Mexican War, the United States gained the current southwest states between Texas and California. 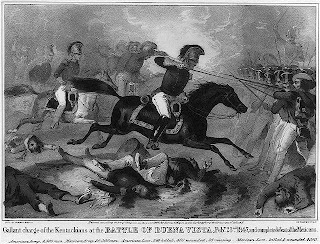 To begin this research, be sure to learn More About US-Mexican War. For a list of battles and more information on the US-Mexican War visit:PBS- US- Mexican War. Approximately 100,000 soldiers served in the US – Mexican War. Seventy-five percent (75,000) enlisted in the volunteer army. The soldiers also served in the Army, Marines, and Navy. Like the Civil War, most deaths were due to disease. Only about 2000 soldiers who died while serving in the Mexican War, died of enemy fire, or battle wounds. The remaining 11,000 died of disease and many were hospitalized. For this reason a good place to begin your search is using medical records. Indexes to Field Records of Hospitals, compiled 1821 - 1912ARC Identifier 655733 / MLR Number PI-17 544BSeries from Record Group 94: Records of the Adjutant General's Office, 1762 - 1984 This series also contains references to the series "Reports and Correspondence, 1861 - 1888" (ARC Identifier 655752), "Surgeons' Reports on Medical Operations in Various Commands, 1861-1865" (ARC Identifier 655739), "Reports on Surgical and Medical Cases, 1860-1879" (ARC Identifier 655743), and "Lists of Casualties in Various Engagements, 1860-1889" (ARC Identifier 655746). As many of the soldiers were volunteers, be sure to check your state repositories. A key to your ancestors’ service is becoming familiar with your states’ activity in the war. Don’t forget to look at county and state biographies and obituaries. In Tennessee, here is a great website to initiate your search: The Volunteer State Goes to War: A Salute to Tennessee Veterans. This website, like many official state websites, will provide us with the battles, officers, and a bit on the causalities. The Military Resource: Mexican War, 1846-1848 on the NARA website reminds us to check for letters of officers and the National Cemeteries. For “regular military service (vs. volunteer) officer records and correspondence may be found in the NARA Adjutant General records. Here is a great finding aid for the NARA Military Service during the Mexican War,1846-1848. This finding aid includes locations of the Compiled Military Service Records, Pension Applications, Volunteer Solider Files, and Remarried Widows based on the Service in War of 1812. As this war was fought on Mexico soil, 750 soldiers of this war were interred at the US National Cemetery in Mexico City. However, less than 10 of these burials have been identified. Visit the Burial Listing at the American Battle Monuments Commission website. Pension Files and Bounty Land: For a quick search at the United States, Index to Mexican War Pension Files, visit the Family Search free website. Veterans who were discharged from the Mexican War were eligible for 160 acres of federal bounty land. Land records are always a great source for genealogical research. For the Mexican War, the bounty-land warrants are filed with pension files at the National Archives can be located in the Textural Records: T317 Index to Mexican War Pension Files, 1887-1926. (Filed by surname for Mexican War, 1846-1848). Visit: Invisible Men: Blacks in the US Army in the Mexican War. African Americans also served on Naval Ships. Mexican war pension for a Cassity ancestor was absolutely vital to distinquishing 'my' Alvin from the other one. His affidavit detailed the battles he was in, who he served with, where he had lived since the war, children's names and so much more. Thanks for highlighting this topic.